Roll up, Roll up! Ladies and Gentlemen, Welcome to the greatest show on earth! Scratch This! is a new and exciting Scratch Platform for artists, musicians and performers of all genres and skills. Our aim is to give opportunity for new and established artists to present and try out new pieces of work and be given opportunity to receive feedback from the audience in a safe and informal way. Our first Scratch This night will be on Saturday 11th June 2016 at Cardiff Speaker Hire’s warehouse, just off Dumballs Road in Cardiff, a short walk from the city centre. The show will be presented as a walkabout/installation sideshow alley followed by a cabaret following the theme of SIDESHOW. The evening will finish with a bit of a party giving the artists a chance to meet the audience and obtain feedback. 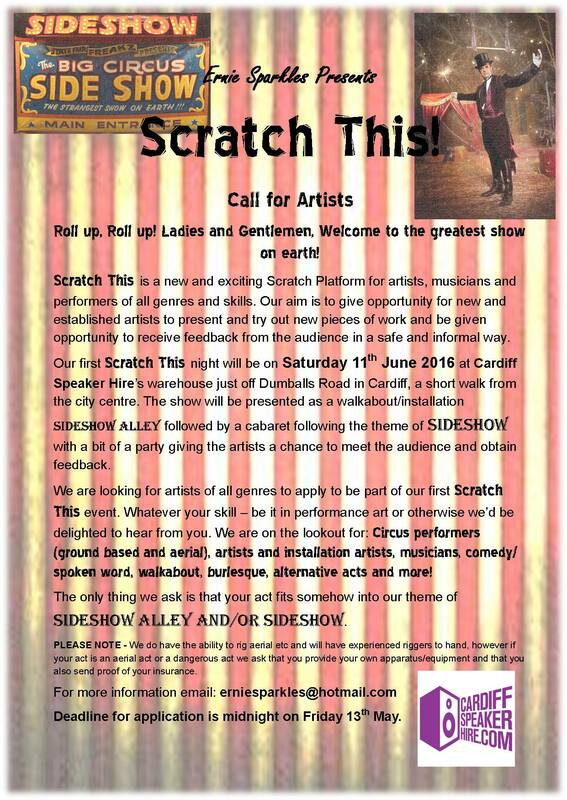 We are looking for artists of all genres to apply to be part of our first Scratch This event. Whatever your skill – be it in performance art or otherwise we’d be delighted to hear from you. We are on the lookout for: Circus performers (ground based and aerial), artists and installation artists, musicians, comedy/spoken word, walkabout, burlesque, alternative acts and more! Your act just needs to fit (somehow!) into our theme of Sideshow Alley and/or sideshow. PLEASE NOTE – We do have the ability to rig aerial etc and will have experienced riggers to hand, however if your act is an aerial act or a dangerous act we ask that you provide your own apparatus/equipment and that you also send proof of your insurance. Deadline for application is midnight on Friday 13 May. APPLY NOW!